Led lights inform from 4..20mA stand of flow up to 630bar(9,100 psi), from minimal quantities like 0,02 L/minute and for diameters from 12mm can be put in practice the fluid-Check®. The leakage sensor fluid-Check® is ready to be use and will be programmed by BOLENDER-Germany according necessities of the client in liters or gallons per minute. It is based on the calorimetric principle, that means the sensor head has an intern thermo element and heating where the running oil temperature will be measured. The measuring cycle takes 3 seconds. The sensor head temperature raises at 2°C. The time for this will be measured and the flow rate will be calculated. The needed time for measuring is 15 seconds. The special on this “made in Germany” product is not only the easy installation of 5 minutes- no cutting pipes and without contamination with an Allen wrench. The hydraulic operator gets with the fluid-Check® sensor and the measuring connection serv-Clip® with ¾” screw that opens a wide choice of measuring devices because one can deinstall the fluid-Check® and install at the same point sensors or manometers for measuring temperature, pressure, etc. BOLENDER-Germany promises to meet the complex requirements for fluid measuring and pipe working with a cheap solution avoiding consequential expensive reparations of hydraulic systems. For pipes over 3“ (88,9 mm) and wall thickness from 6 mm ask about our adapter SC-XE-607. You get pro sensor a data sheet with curves (comparison mA with l/min). 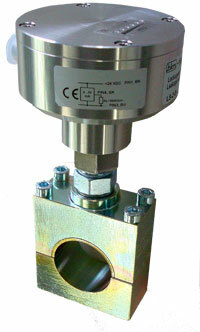 Inform us the ID of the pipeline and the wished measuring range from/to in l/min.